Notice a theme? 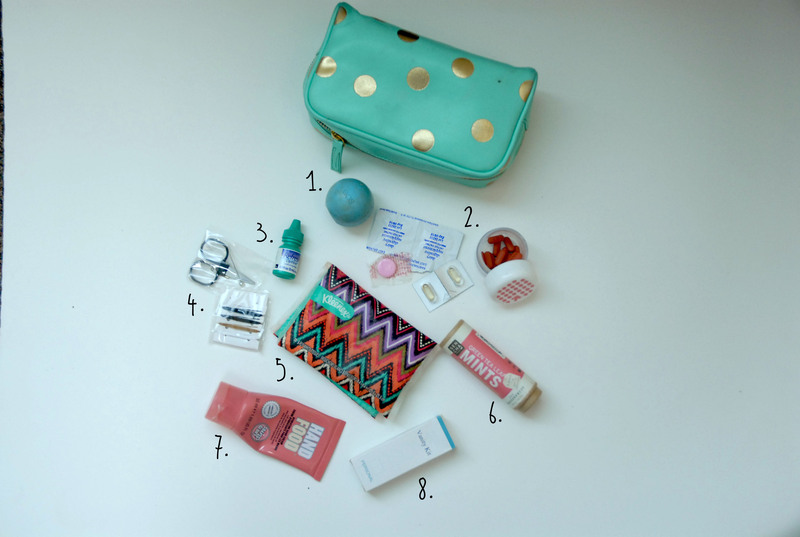 If you read my last major post, you’ll know that I adore the color mint green. 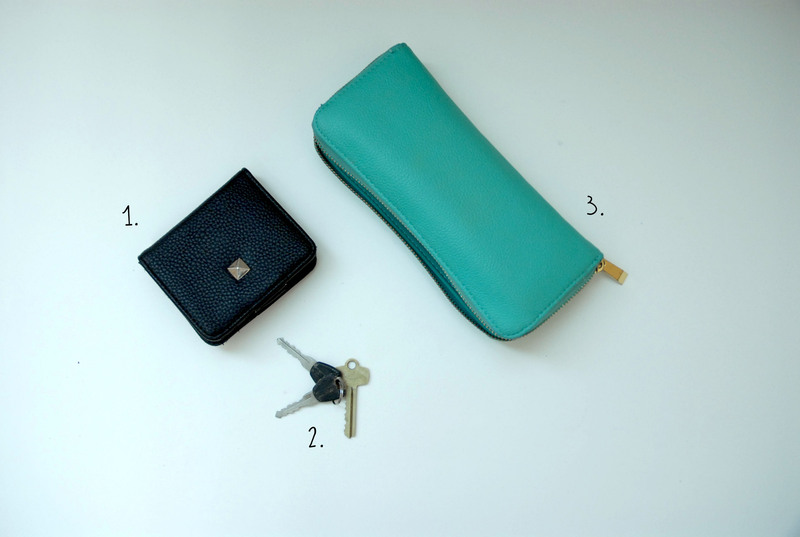 These are the basic elements I carry around with me: my sunglasses case, a pouch, and my wallets. 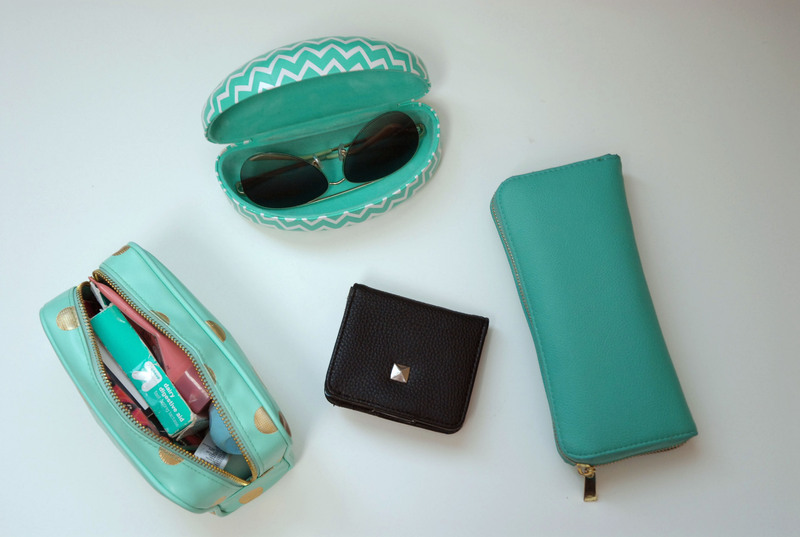 The wallets and pouch go in the large compartment and the sunglasses case lives in the front part. There are also two small pockets on the inside of the larger compartment, but more on that later. It wears pretty long on me, but I am also very short. Card holder– This is more of a mini wallet, but I use it primarily for keeping the bare essentials with me when I am on campus. It has a clear window for an ID, five slots for cards (three on one side and one each under the main wings), an opening for cash, and a coin slot on the backside. It is super convenient since I can put my school ID in it and not have to fish it out of a lanyard and has plenty of spots to hold my debit card and key card to get into my building. The cash slot if perfect for keeping a few bills on me and the coins pouch is where I keep my keys. I can move this in and out of my purse without needing to dig through my purse and look for things. My sister got it for me at Charming Charlie’s a year ago for my birthday, I think. Keys– These are the keys to my bike lock and room. I keep them in the back side of my mini wallet. Wallet– This is my main wallet. It contains my other cards, driver’s license, receipts, gift cards and coins. I got it from Target about a year ago, and I love the classic style of it but modern color. Plus, it is the perfect size, not too big or small. This exact color is no longer available, but there are plenty of other colors to choose from in this style. Get it here. 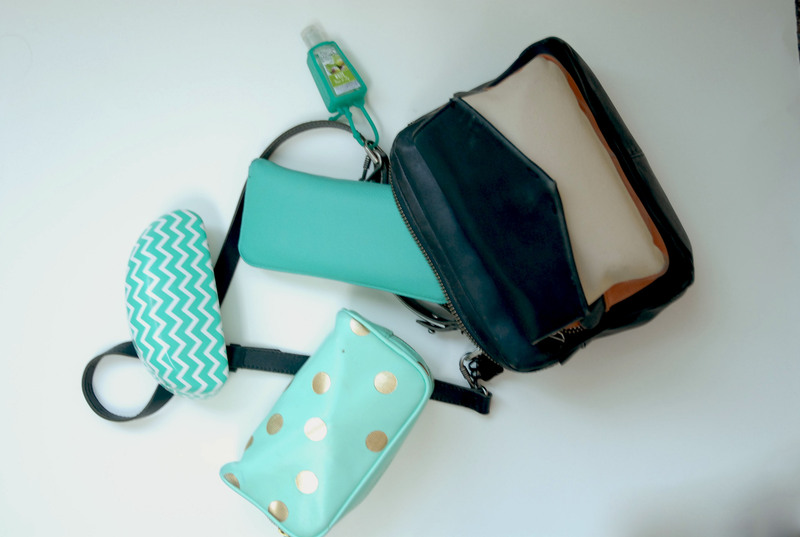 Sunglasses case– This is from Target. I like the hard case for its fun chevron design and turquoise color, plus it is super functional. It’s a good size for tall sunglasses like the ones I have. I keep this in that front compartment where it fits perfectly. Get it here. 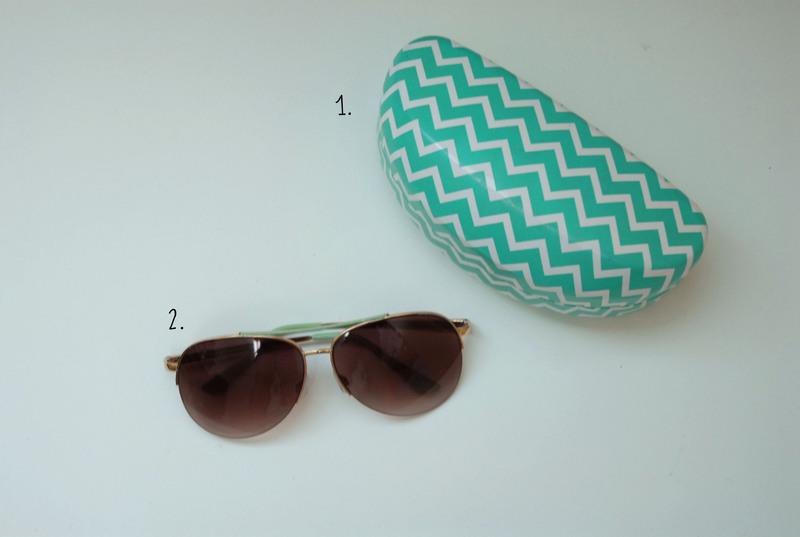 Aviators– These are my favorite pair of sunglasses and are also from Target. They are an oversized aviator style with wireless bottom rims and gold hardware. There is a decorative bar across the top and mint accents. I love these since I have such wide-set eyes and the slightly oversized teardrop shape of the lenses elongate and complement my face shape by occupying space more downward and evenly. I bought these about a year ago as well but they are still available in store, or a similar style is online here. 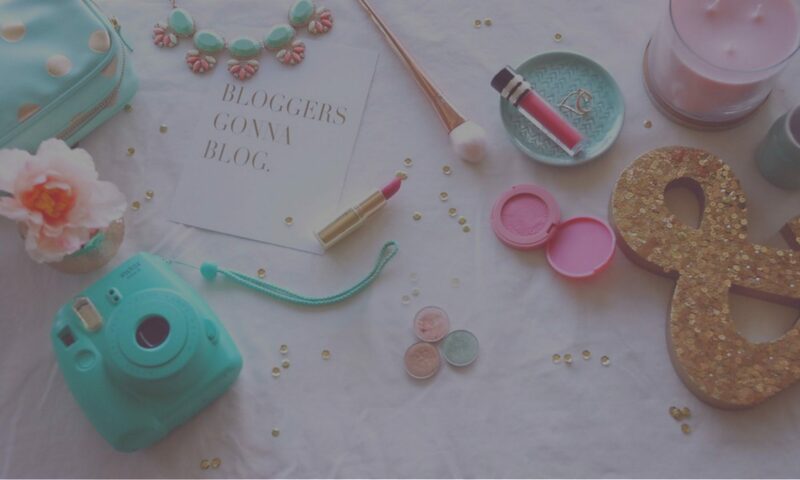 EOS Lipbalm– Yes, I have one of those typical spheres of chapstick. This is the Blueberry Acai flavor and it is delicious. Various medicines– As the daughter of a nurse, I always come prepared with basic medical bits. I usually have bandaids, but used my last one for a blister recently and have yet to replace it. I carry a bit of ibuprofen in a small plastic container from the travel section at Target. Also, I am lactose intolerant so I always have some dairy digestive aid on hand. Finally, I have some Benadryl and Pepto Bismol for emergencies. Eyedrops– This is a mini size of rehydrating drops for your eyes. I am a contact lens wearer so having these on hand is essential for when allergy season comes around, or I’ve been wearing my contacts for several hours. 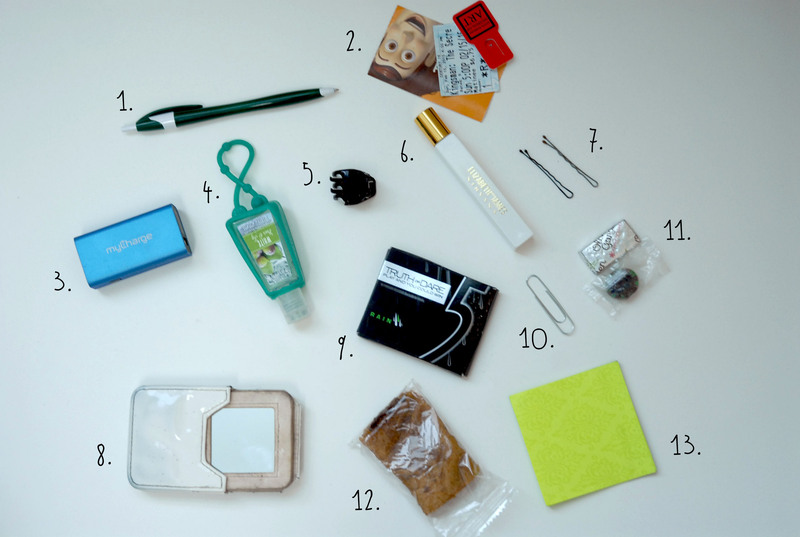 Sewing kit– This is the dinkiest sewing kit that I took from a hotel. It has a tiny, cheap pair of scissors, bit of neutral thread, a button, a pin, and a needle. Tissue– This is a travel size of Kleenex. It is not the typical size that you get at the register at Target, but the ones that come from the travel section. I prefer this packaging since it is resealable as opposed to the other one. Mints– These are green tea and dragon fruit flavored mints. I bought these at a Japanese market in LA and have yet to find them in stores. Hand cream– This is the Hand Food from Soap and Glory. Many beauty gurus have raved about this hand cream. It is a subtly rose scented and light yet moisturizing. I got this from the treacherous stand at the checkout at Sephora. Vanity kit– This is also from a hotel. It is contains a cotton round, some q-tips, a nail file, and flosser. Pen– This is just a generic pen that I got from my school. It is always convenient to have a pen on hand. I keep this in one of the two small pockets on the inner wall of the main compartment. Tickets– I have a handful of random ticket stubs floating around in various parts of my purse. These are just a few, but there’s one from Disneyland when I visited in January, a movie ticket from Kingsman: The Secret Service (great movie, I would totally recommend! ), and a pass for an art museum. Portable charger– This is an external battery for charging your phone on the go. It has a mini USB port on one end and a traditional USB on the other. You charge it up before you leave the house and use a cord that works with your phone to revive the battery life of your device. I don’t always have this on hand, but I am currently traveling which is the best time to have one of these. Hand sanitizer– This is the Pocketbac anti-bacteria hand gel from Bath and Body Works. The scent is White Pear and Fig from their winter collection and the holder is also from Bath and Body Works about 3 years ago. It is just a teal and sparkle basic one, but they always have plenty of cute designs to keep hand sanitizer, well, handy. I go through these Pocketbacs like crazy though, and they are practically always on sale 5 for $5. The scents are always changing too, and almost always smell delicious as well. Hair clip– This is a basic small claw clip that I keep clipped to the strap of my bag. Since it is on the outside of the bag, I have easy access to something to get my hair out of my face. I usually also have a hairtie in my pouch as back up to this, but it seems the hairtie elves have gotten a hold of it and I will need to replace it. Perfume Rollerball– This is the Elizabeth and James White Nirvana rollerball from Sephora which I got about a year ago. I love this scent since it is perfect for day and night and the size of it is perfect for your purse. I keep this in the small pockets in the main compartment. Bobby pins– These floater bobby pins usually end up in my purse when I take down my hair until I accumulate a collection of them and have to put them back on my vanity. Pocket mirror– This is a double sided travel mirror. It has a magnifying and regular side. I got it from Bath and Body Works about 5 years ago which is why it is so dirty. Gum– This is 5 gum in the spearmint flavor. I usually also have a pack of a fruity flavor as well but I have currently chewed up all of that. I keep this in the small pockets as well. A paperclip– I found this randomly at the bottom of my bag and kept it there since it could possibly be handy someday. Maybe I’ll need to pick a lock or hold papers together or something. Various mints– These have accumulated from restaurant visits over the months. Not much to say here. Snack– This may look gross, but it is still good. It is a semi-crushed Lemon Figgy Bar from Nature Box. This is basically a large Fig Newton with lemon flavor and is the perfect size for taking a small snack with you. Hangry crisis averted. Post-it notes– I keep a few of these around in case I need to write down numbers or lists on the go. I prefer sticky notes since they have an adhesive and you don’t have worry about them moving if you leave it on a car or something. Alright, that’s it! I hope you enjoyed getting a sneak peek into my handbag. Personally, I love these types of posts since they can reveal so much about a person. Leave me a comment below or on social media telling me what you keep in your bag. I hope you enjoyed this and I will see you next week! *If you noticed this post featured a lot of items from Target. This post is not officially sponsored by them, but I am a Target affiliate. However, I have always loved Target, before I even started working with them, and endorse them because I truly enjoy their products and services. Use this link to save on women’s accessories, including the wallet I featured here.